Bank of Baroda Debit Card enables you to access Bank of Baroda Interconnected ATMs spread across major centres in the country, ATMs of member banks of National Financial Switch in India and multi million ATMs worldwide. These cards also provide you convenience of usage at literally all major merchant outlets in India and abroad, make online purchases through internet. Enjoy the convenience of cash-less purchasing power without the fear of overdrawing your account. We offer wide range of debit cards to suit your growing requirements and lifestyle. Visa Electron Debit Card is an ideal choice for your requirement of performance, simplicity, flexibility. For securing hotel reservations, buying books online, or making everyday purchases Electron, offers value proposition, reliable form of payment. Bank of Baroda Interconnected ATMs in India. Member Bank’s ATM of National Financial Switch in India. Make Online purchases through Internet. For convenient shopping, travelling, dining out at many locations in India where Visa Cards are accepted with PIN based authorisations. We are pleased to introduce another customer centric initiative by launching RuPay Platinum Debit Card. The card has been aimed to provide attractive offers and scheme in coordination with NPCI. Bank of Baroda Interconnected ATMs spread across major centres in the country. Member Bank’s ATMs of National Financial Switch in the country. For convenient shopping, dining out at outlets accepting RuPay Cards in India and Abroad. For International usage the card can be used at ATM/POS terminals displaying Discover, Diners Club International or Pulse logos. MasterCard Platinum, a platinum choice for our premium customers, is envisaged to meet their requirement of higher spend/cash withdrawal. The card is issued in affiliation with MasterCard and is usable at any ATM/ Merchant outlet having MasterCard logo and NFS member bank ATMs. The card makes merchant and online shopping very convenient and safe. Bank of Baroda Interconnected ATMs and NFS Member Bank ATMs in India. MasterCard member bank ATMs bearing MasterCard logo in India and abroad. For convenient shopping, travelling, dining out at outlets accepting Master cards in India and abroad. For hassle free online shopping through internet. More than 6,900 Bank of Baroda Interconnected ATMs spread across major centers in the country. Member banks (100 plus) of National Financial Switch having more than 1,18,000+ ATMs in the country. NPCI member bank ATMs all over the country bearing RuPay logo. For convenient shopping, dining out at outlets accepting RuPay Cards in India. RuPay Debit Cards have the additional security of PIN based authorization even for transactions made at Merchant outlets. In our pursuit to broaden product range to allow alternatives to Customer s, we are pleased To introduce “Master Card Classic Chip” debit card for domestic use in affiliation with Master Card. 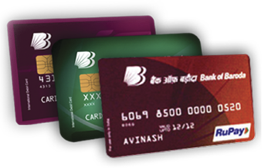 The card can be used at NFS member bank ATMs in the country and is also Enable for POS/Online purchases in India. Purchase up to RS 50,000/- per day at POS/e-commerce merchants Wherever Master Cards are accepted in India. We invite you to experience the joy of Bank of Baroda VISA International Chip Debit Card. Member banks of National Financial Switch having more than 1,18,000+ ATMs in the country. VISA member Bank ATMs all over the world bearing VISA logo. For convenient shopping, dining out at millions of outlets accepting VISA Cards worldwide. Make online purchase through internet. How to use your International Chip Debit Card at POS? Call for any kind of supoort and reports us for loss or theft.